Everyone today is in worry due to weight gain issues. Junk food intakes, imbalanced hormones, sedentary lifestyles, taking medicines without a proper prescription, ill-timed eating routine are few of the many factors contributing toward weight gain. Every third person is an overweight. We really need to realise the importance of a healthy fit body. The busy, hectic, workaholic life of the town, wittingly or unwittingly makes one eat fried, fatty, tasty (for sure, they are!!) and most importantly, ready to eat food. For such a calorie full meal to get digested, one needs to be aware of the important exercises and yogasanas. People need to understand and keep in mind certain things that are unknowingly done. It is not simply determination, or a deficiency in that department, that influences us to put on weight or lose it. It is that unfortunate tendency we created (without acknowledging it), such as going out for work without a proper breakfast and then munching over some chips or burger. Researches show that what matters is not only what we eat but also when we eat. We should always try to eat healthy food in necessary amount than unhealthy food even in chunks. A new found coping strategy(because we stress a lot!!) these days is overeating!! • eat sprouts and protein-rich diet, chop carbs. 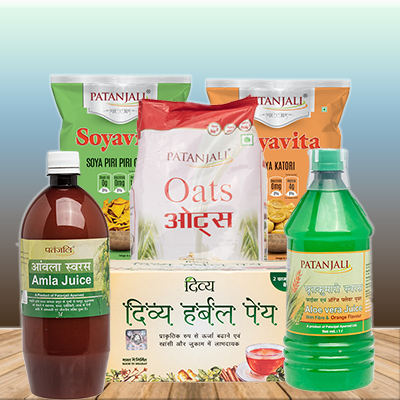 Also, to boost it up all, few products from Patanjali are available in the market as well as with e-commerce platform, which helps you to reduce weight at a faster pace. Divya medohar Vati is one such remedy which helps in digesting the food we eat, properly. No doubts, Green tea is a drink that pops up in our head when we go dieting, or plan a diet!! Divya Peya Herbal Tea is a natural enhancer, made up of Kali Mirch, Ashwagandha. It regulates the digestive fire and is helpful in stomach related disorders. There are other options too which will help you to achieve the fitness goal, like, amla juice, Aloe vera juice, Triphala guggul. Now that the summers are in and so are the juicy fruits. Fruits can be consumed, to meet the fibre and water need of the body. Pineapple, Watermelon, Figs, Peaches, Grapes, Banana are options that will keep you fuller, hydrated and help you get that flat tummy. Any time in the year, you can always go ahead with Patanjali oats and Patanjali breakfast range. Also, if you ever want to munch on some snack or anything of that sort, go in for Soyavita range or the roasted diet, full of protein to make you active, full and lively. SO did you introspect today?